This column sponsored by Boynton Financial — twice winner of the prestigious Texas Monthly 5 Star award for wealth managers. Need help in planning and guidance for building your retirement nest egg? Just call Lotta Sports’ favorite pro golfer, president and CEO Frank Boynton, at the Kerrville office 830-370-1377 or George Fisher in the San Antonio location 210- 602-3891. The New Year started with Rick’s Ohio State Buckeyes playing the Alabama Crimson Tide in the National Championship semi-finals. TCU and Baylor fans were very upset that those schools were snubbed by the committee who instead chose the “revered for TV ratings” Ohio State team. I was in awe by the Buckeyes resistance to so many obstacles getting to that game including losing two quarterbacks to injury during the regular season. Rick and I watched the game in amazement as not only did the Buckeyes beat Alabama 42-35; they did it in very convincing fashion halting a late surge by the Tide. The reality hit us fast — The Buckeyes would be coming to North Texas the following week! 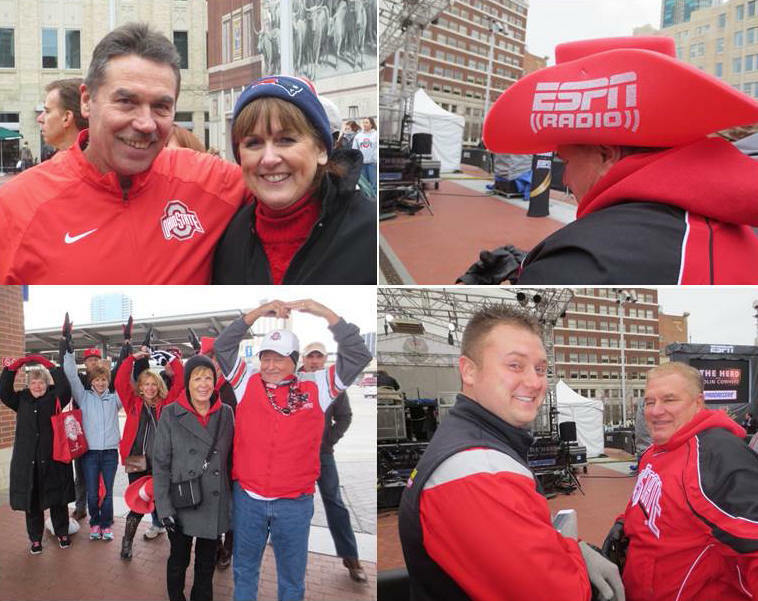 Meanwhile in Ohio, Rick’s brother-in-law Gary and nephew Bret worked on getting tickets to the first National Championship. When North Texas puts on a sporting event, it’s usually an extravaganza and the National Championship was beyond expectations! 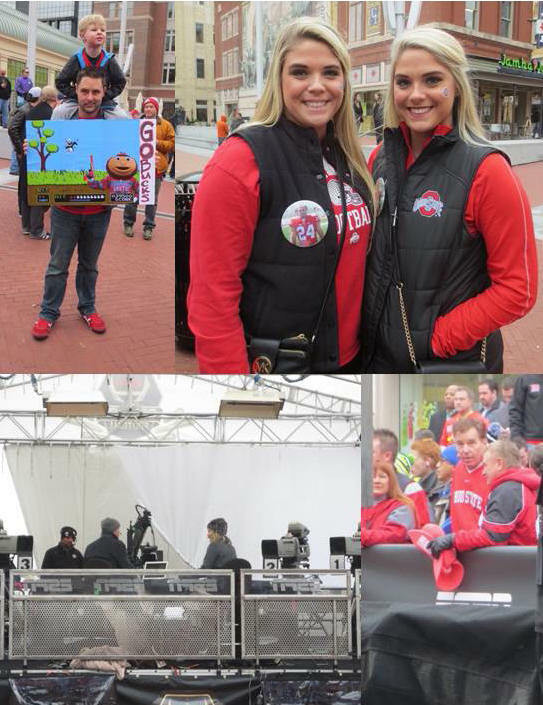 ESPN set up camp at Sundance Square in Ft. Worth a week before and produced their shows live. Over in Dallas, the convention center had interactive displays, pep rallies, appearances/Q & A with the teams and autograph sessions by former collegiate stars. For this sports aficionado, I found myself like a kid in a candy store trying to decide what events to attend. Friday morning Rick was off so I asked him to take me to see the ESPN production. When we arrived, it was just like what we witnessed the night before watching it on TV. Fans in both school’s colors were jumping up and down waving crazy signs in hopes of catching the cameraman’s eye. Just a few yards away from the fans were the ESPN personalities on-the-air. Between segments, I wandered around to the side entrance. As luck would have it, the ESPN security guy Kinely Williams was approachable including let us pose with him for pictures. While we stood by the back entrance, former Dallas Cowboys Darren Woodson exited by us and former Heisman winner Desmond Howard was escorted in. After we returned to our post as the backdrop of the show, the cameraman cued us to wave and yell as he panned the crowd. Despite being dressed for the Artic, the bone-chilling temperatures shortened our time at the outdoor event. We had an adventure finding our way out of the city as the high buildings confused the navigational system. Poor Rick was stressing as he needed to be at work in less than two hours. The following day Bret spent part of the day at the convention center touring the displays as well as seeing coach and player interviews. Meanwhile at home, I took a hiatus from college football to watch the NFL playoffs. The early game became one of the most disputable games in recent history. It was disbelief (and the end of the year) for the Cowboys when their winning touchdown was nullified by a rule in the NFL handbook. Next was my Patriots game and by then Bret had arrived. Little did he realize the magnitude of watching football with me and the potential for Oscar winning theatrics. Nothing was going right for my team. I was at a loss as I buried my head in my hands followed by a checklist of my lucky clothes. Bret quietly suggested that maybe it was my hair holder. AH!!!!!!!!!! It was! I ripped out the red band and twisted in my navy one. The Patriots made a comeback and never looked back. Bret, still in shock over my game-watching, left for Love Field to pick-up his dad.